Tokyo, February 20, 2013 - Hitachi, Ltd. (TSE:6501, "Hitachi") today announced the development of a gamma camera capable of measuring gamma-ray*1 intensity distribution under a high dose rate environment of 300mSv/h*2 with the support of the New Energy Development Organization (NEDO), Japan. In July 2011, Hitachi together with Hitachi GE Nuclear Energy, Ltd ("Hitachi GE") developed a gamma camera, for use in nuclear power plants under dose rate environments of less than 15mSv/h, that displayed the intensity of gamma-ray distribution for each nuclide*3 through different colors. This gamma camera is being used for surveying inside the reactor building of the Fukushima Dai-Ichi Power Plant. From February 2012, Hitachi participated in the NEDO project to develop a gamma camera that could be used under the higher environmental dose rates necessary to survey the entire area of the reactor building. In this development, Hitachi embedded a part of the signal processing function into the hardware as well as optimized the shield structure, to enable measurement under highly radioactive environments, and added a shield structure to increase accuracy, thus enabling measurement of gamma-ray intensity distribution under a high dose rate environment of 300mSv/h (20 times higher than previous levels). In order to enable use under high dose rate environments, a part of the signal processing function in the gamma camera software was integrated into the FPGA*4 as hardware. The signal processing performance was doubled thereby doubling the upper limit of the gamma-ray measurement rate, and enabling the equipment to be used under twice higher dose rate environments. Further, the thickness of the shield for the two-dimensional pixel-type gamma-ray detector module*5 built into the gamma camera was increased, thus enabling measurement under ten times higher dose rate environments than previous levels. By incorporating these units in the gamma camera developed, measurement was enabled under almost twenty times higher dose rate environments (300mSv/h). In order to use this gamma camera under high dose rate environments, it is necessary to control it remotely with a robot. Remote controlled measurement of inside the reactor building was achieved by creating a system which embeds the data and control signals of the gamma camera in the communication functions of the wireless robot. 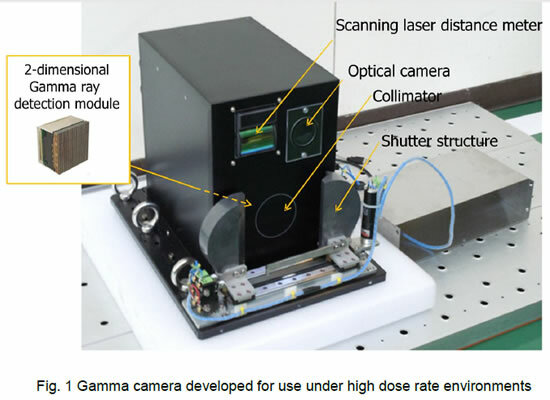 To ensure that the gamma camera meets the weight limit for mounting on a robot (less than 80kg), the shield structure of the two-dimensional pixel-type gamma-ray detector module was optimized. As a wide area such as the floors and walls within a nuclear power plant may be contaminated, the gamma-rays emitted from sources other than the target object become a source of error and lower measurement accuracy. In order to reduce this error, a shutter mechanism was placed in front of the gamma camera collimator. *6 When the shutter is open, both the gamma-rays from the surrounding which are the source of error, and the gamma-rays from the target are measured. When the shutter is closed, only the gamma-rays from the surroundings, the source of error, are measured. From the difference, it is possible to extract the gamma-rays from the target, thus improving the ability to identify areas of dose accumulation such as hot spots. Further, a scanning laser distance meter*7 was installed to measure the distance from the camera to the target object for each pixel, thus enabling higher accuracy measurement by compensating for the measurement intensity according to the distance. The gamma camera developed will be applied to contamination surveys in disaster areas in cooperation with the Laboratory of Professor TADOKORO Satoshi in Information and Applied Technology at the Graduate School of Information Sciences, Tohoku University. Gamma-ray: A strong electromagnetic wave released by radioactive elements, with the ability to penetrate matter. Nuclide: An atomic species determined by the number of protons and neutrons. 2-dimensional pixel-type gamma-ray detector module: A module which combines two-dimensionally arranged gamma-ray detectors with signal readout circuits from the detectors. Collimator: A device which limits the direction of radiation incidence to the detector, often made of lead or tungsten for their high radiation shielding properties. Scanning laser distance meter: Equipment which determines distances to the measurement area by measuring multiple points by laser scanning.